This is the third in a 4-Part Series of reviews dedicated to exploring a single cigar size across each of the Cohiba brands offered by General Cigar. As it happens, it’s robustos that we’re sampling from all four lines of Cohiba. This extensive survey is made possible by Victoria McKee, Director of Public Relations at General Cigar Company. Featured this time is the Cohiba XV 550, a robusto we received from General Cigar back in May of this year. The XV stands for Extra Vigoroso. Produced at the General Cigar Dominicana factory, the Cohiba XV 550 features a gorgeous, rich-looking wrapper with plenty of that heady aroma of thorough fermentation. The current Cigar Aficionado rating for it is 84 (Oct, 2007). In response to the rising demand for fuller-flavored cigars, cigar master Daniel Nuñez set out to create an extension of the successful COHIBA line. The result is COHIBA XV, an Extra Vigoroso cigar made with all the inspiration and dedication to quality that have made COHIBA one of the most respected premium brands in the country. The most distinctive leaf of a COHIBA XV cigar is its sun-grown Sumatra wrapper from Ecuador. Harvested only from the tops of the tobacco plants, each of these wrapper leaves is aged in tercio for three years. The flavor is then enhanced by aging all of the leaves again for six months in crates of fragrant cedar. 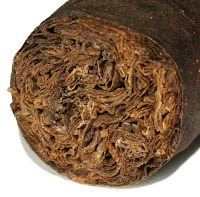 In crafting COHIBA XV cigars, the most flavorful Nicaraguan Ligero and Dominican Piloto Cubano Ligero are bound with the richest three-year-old Connecticut Broadleaf. The result is a cigar that is made, not only to please, but also to impress. Following Cigar Aficionado's 4-part rating system (Appearance & Construction, Flavor, Smoking Characteristics, and Overall Impression) ten of our club’s members took part in the tasting survey for this review. First impressions of the wrapper were: dark, rich, and velvety-looking! Only a couple of the cigars displayed minor visual imperfections. As is evident by our high scoring of Part I (below) this is one well-crafted beauty. Similar to the high quality appearance, most of these XV’s drew effortlessly. Fortunately, only a couple faltered by drawing too tight, and as one club member put it, “…really held the cigar back.” Likewise for combustion; a few didn’t burn very well, but most did just fine. There were no issues with regard to the ash that could be considered detrimental. The flavors were a bit of a mixed bag for our group of tasters. A couple guys found their cigars growing harsh mid-way through, a couple found the XV mediocre, and six of us classified it as ‘very good’ to ‘excellent’. Tasting notes ranged from hickory to dark chocolate and coffee. After throwing out the highest and lowest, then averaging the remaining scores, The Cohiba Club's official rating for the Cohiba XV 550 is 85. A ‘very good' cigar. Strangely, as fondly as many of us reported liking the Cohiba XV, it didn’t score phenomenally high. Not to be dismissed, however, a rating in the mid-eighties is a high accolade indeed. Too often these days, a cigar buyer’s first instinct is to only shop for cigars rated 90 or higher, which has it’s own share of controversy, but that’s a discussion for another day. In any event, we do recommend that you give it a try and see for yourself. 89 for the Cohiba (Classic) Robusto. 84 for the Cohiba Puro Dominicana Robusto. 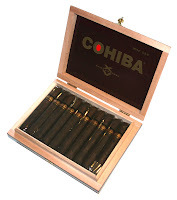 …it is apparent that our group prefers the standard Cohiba line – so far! There is one more to go after all. Check back here in the coming weeks for the fourth and final post on the Cohiba Black Tubo Crystal – again in robusto size. And speaking of Cohibas, visit your local cigar shop soon for the latest Cohiba offer! General Cigar's Cohiba Lifestyle contest, which will be exclusive to brick and mortar stores, features a Buy 3 Get 1 Free pack of Cohiba cigars. You’ll also be able to enter a drawing in which the grand prize will be the ultimate dream vacation in a private jet for one customer and six friends, with a total prize value of $75,000.